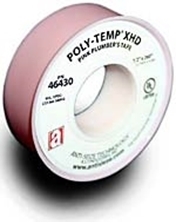 POLY-TEMP® PNK Pink Plumber's PTFE Tape is a Full Density PTFE Thread Seal Tape especially designed for professional plumbers. The pink color distinguishes itself from low-grades of PTFE tapes. Suitable for demanding industrial and commercial plumbing applications. Strong and durable with positive sealing for tough applications. Recommended for galvanized pipe, copper, brass, chrome, or other plated pipe. UL Recognized Component Poly-Temp® Thread Seal Tapes are 100% PTFE from the highest quality resins available. This universal thread sealant can be used on all types of metal or plastic pipe connections and effectively seal a vast array of chemicals. Suitable for oxygen systems.